There’s a lot of great pizzas in Ocala, but sometimes you just want something different. Fiore’s Cafe has relocated to where the old Pizza Hut was on 441 South just before the overpass. They were normally just open for dinners but are now open for lunch as well. I have to say, the New York Style Pizza did not disappoint, in fact, we went back a few days later and got some more as they are delicious! If I can ever get past the pizza, which is huge and only cost about $12, I look forward to trying some of their other dishes! Today, the food of Italy is still one of the world’s most popular and most imitated. While dishes from other countries may periodically come into vogue, people everywhere continue to eat and cook in the Italian manner. 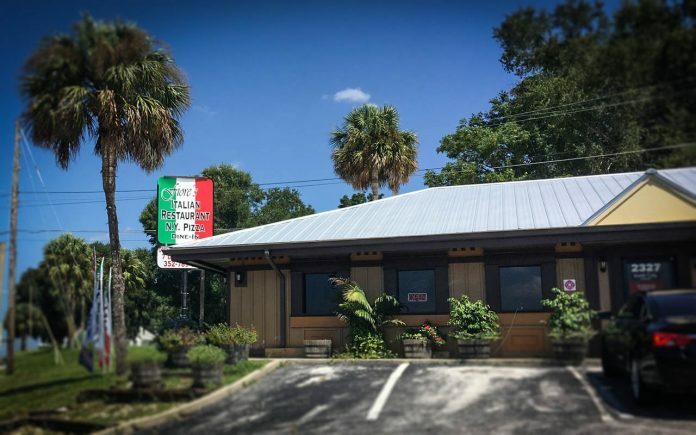 If you’re looking for a great Italian restaurant, it is our wish that you enjoy this popular, delicious Italian cuisine, including the best New York pizza in the area, at Fiore’s Cafe right here in downtown Ocala, Florida. VISIT FIORES CAFE IN OCALA TODAY! Next articleSanta on the Square!